LOS ANGELES - A Marvel Comics hero is giving George Washington some company on the quarter, but the U.S. Mint doesn’t think the stunt is so super. 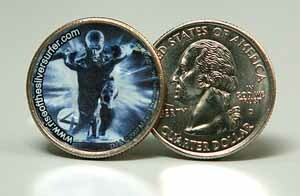 To promote the upcoming film “Fantastic Four: Rise of the Silver Surfer,” 20th Century Fox and The Franklin Mint altered 40,000 U.S. quarters to feature the character. The U.S. Mint said in a news release Friday that it learned of the promotional quarter this week and advised the studio and The Franklin Mint they were breaking the law. It is illegal to turn a coin into an advertising vehicle, and violators can face a fine. “The promotion is in no way approved, authorized, endorsed, or sponsored by the United States Mint, nor is it in any way associated or affiliated with the United States Mint,” according to the release. The federal mint did not say whether the studio or the private Franklin Mint would face a penalty. Here are a few more articles about Fox being in trouble, and another one claiming the coins are illegal.